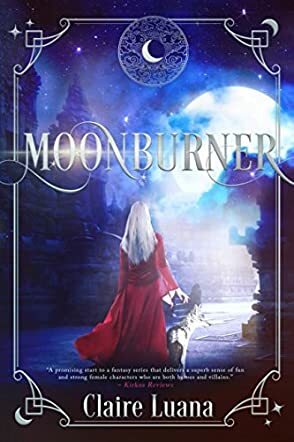 In Moonburner by Claire Luana, Kia's parents raised her as a boy to cover up the fact she was born with great magical power that allowed her to draw power from the moon. In their world, female moonburners are lifelong enemies to the male sunburners who draw power from the sun. When her village discovers the truth, they send her to find death, but the gods have other plans. Claire Luana's Moonburner heroine is strong but compassionate, innocent and yet filled with all the worldly knowledge her parents could safely instill within her. She leaves behind a happy, if not a bit warped, childhood to face the challenges of a burgeoning warrior who is forced into the role of protector. And Kia does all of this with the grace of one who truly believes in doing the right thing. I loved, loved, loved Moonburner. The world is easily understood. The characters are realistic, especially Kia. So much so, that I was eager to know her story. I cried when she did. I suffered her injuries and reveled in her successes. And I dearly adored her constant companion Quitsu, a smart-mouthed silver fox whose life is magically tied to Kia's. When I finished reading Kia's story, I was immediately ready for the yet to be released Sunburner sequel. I recommend this book to both young adults and older who treasure a good story that finds a happy medium between breathtaking action and heartfelt emotion. I look forward to reading the sequel, Sunburner.